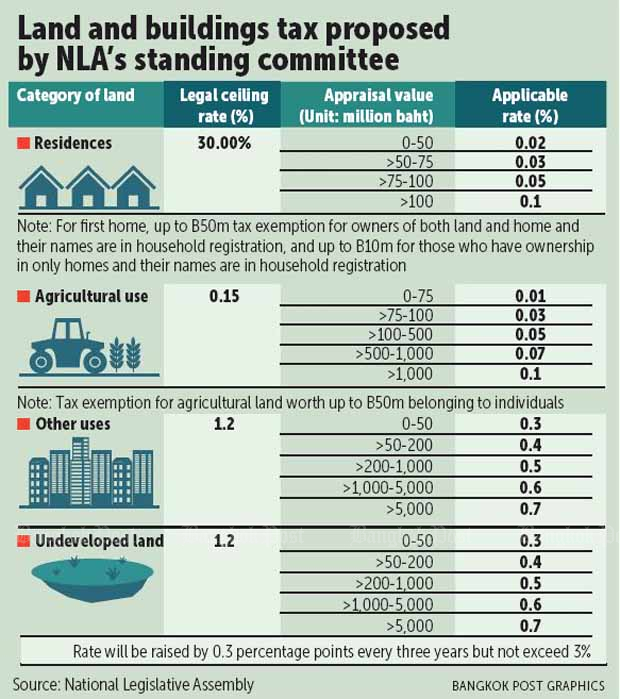 The long-awaited draft bill on the land and buildings tax is expected to head to the National Legislative Assembly (NLA) for a second reading in mid-November, with the new property tax scheduled to take effect in January 2020. The bill was agreed upon by the NLA’s standing committee but was stuck for nearly two years after the first hearing, said Deputy Finance Minister Wisudhi Srisuphan. The new bill is expected to sail through the lawmakers’ session, he said. The new property tax is a last-ditch effort by the Finance Ministry before the general election next year. The land and buildings tax will replace the house and land tax and the local development tax, which have drawn criticism for being regressive and outdated. 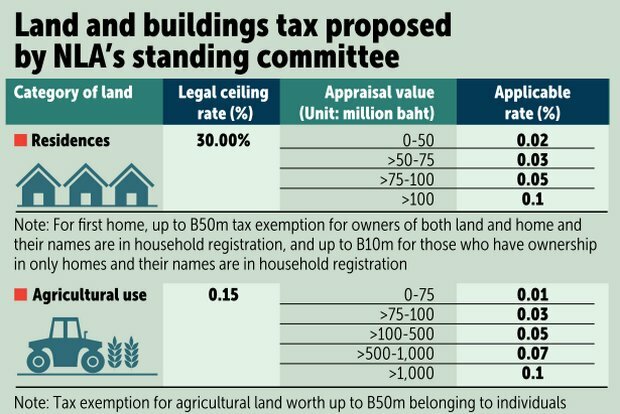 According to the land and buildings tax rate supported by the NLA’s standing committee, the tax will be levied on first homes and land owned by individuals and used for agricultural purposes with appraisal prices above 50 million baht. The rate will be applied to land value exceeding 50 million baht. To enjoy the 50-million-baht tax exemption for first homes, owners must possess both land and homes and their names must be in household registration documents. The tax exemption for first homes will be lowered to 10 million baht if the individual owns the land but is not named in the household registration. First homes with appraisal prices of 50-75 million baht will be taxed at 0.03%, of 75-100 million at 0.05%, and of more than 100 million at 0.1%. The rates will also be applied to second homes, which will be taxed at 0.02% for appraisal value up to 50 million baht. Mr Wisudhi said owners of first homes with appraisal value of 60 million baht will be charged only 1,000 baht a year. Land used for agricultural purposes with appraisal prices of 50-75 million baht will be taxed at 0.01%, of 75-100 million at 0.03%, of 100-500 million at 0.05%, from 500 million to 1 billion at 0.07% and more than 1 billion at 0.1%. If land used for agricultural purposes is owned by companies, it will be taxed 0.01% of appraisal prices of up to 75 million baht. Mr Wisudhi said land for agricultural use owned by individuals will be tax-exempt for three years after the law is enforced, regardless of appraisal prices. Land for other uses will be taxed 0.3-0.7%. For vacant or undeveloped land, the tax rate will also be the same as land for other purposes, but the rates will be raised 0.3 percentage points every three years until the total tax hits 3%. Based on the proposed tax rates, the cap of 3% will be reached after 27 years, Mr Wisudhi said. He said the proposed bill will also allow landlords who are subject to higher property tax bills to gradually meet the increase in tax burden each year with a 25% increase over four years. For example, a landlord liable for an additional tax payment of 1,000 baht after the land and buildings tax enactment will be subject to the 250-baht incremental tax for the first year, the 500-baht incremental in the second, the 750-baht incremental in the third and the 1,000-baht incremental from the fourth year.